The 30,000-plus spectators at Suncorp last night were constantly on their feet saluting the dynamic 80-minute displays of Queenslanders Will Genia, and Quade Cooper, as they combined to cut the defending Super champion Bulls down to size 39-30. We all know how brilliant both can be, but last night they raised the performance bar to an astonishing new height. And the men-in-red reacted warmly to the Pied Pipers. The Reds ran in six tries to three, and it was only the Bulls’ magnificent swarming defence that stopped the try-fest at half a dozen. But the scoreline was flattering to the Bulls. Their express winger Bjorn Basson scored a seemingly impossible try just before the break, taking the Bulls’ kick-off inside the Reds quarter on the full to touch down untouched. In over six decades watching rugby, I’ve never seen anything like it. Extraordinary. And in the shadow of full-time with the Reds in an unassailable position leading 39-23, and switched off, Basson chip-kicked and enjoyed a perfect bounce to dot down, again untouched. Basson was worth 14 points – a 39-16 Reds’ scoreline was more appropriate. That gave the Reds six wins on the trot this season, to equal their record set in 1996 at Super 10 level, when Tim Horan was skipper. Last night he was in the Fox commentary box. But this was also a record eighth successive win at Suncorp. It has become the Reds’ fortress as they await next week’s grudge-game of the tournament against arch-enemies the NSW Waratahs. 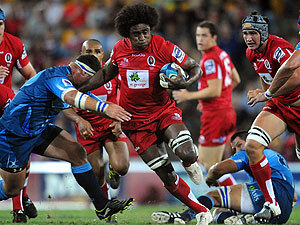 In the second round, on February 26, the men-in-blue comprehensively stitched up the Reds 30-6 at the SFS. It was one-way traffic. The embarrassment was a wake-up call for the Reds, and they haven’t lost since – beating the Brumbies 31-25, Rebels 53-3, Cheetahs 41-8, Lions 30-25, and the previously unbeaten Stormers, at Newlands, 19-6. The success streak has been triggered by the Genia-Cooper combination. Once they started to fire, so did the team. In the same period, the Waratahs have been soundly thumped by the Crusaders 33-18, the lowly Cheetahs 23-3, and the Auckland Blues overnight at Eden Park 31-17. The Blues led 31-7 at the break, scoring five tries to one, but took the pedal off the metal in the second session to allow the Waratahs to salvage some pride. Not a lot, but some – which is a lot more than none. We know what’s right with the Reds – Will Genia and Quade Cooper. But what’s wrong with the Waratahs? They can’t keep hiding behind injured skipper Phil Waugh and utility back Berrick Barnes. That argument is a cop-out, it doesn’t hold any water. There’s no nice way to say it, but every time the Waratahs lose it’s because they played dumb, dumb, and dumber rugby. They lose their structure, their defence patterns, their support play, and their passion to win. And there’s nothing left in the tank. There were two incidents last night against the Blues, to emphasise the point. In the 52nd minute with the Blues leading 31-7 acting skipper Dean Mumm elected to shoot for a penalty goal, with the Waratahs having the momentum on attack, deep inside the Blues’ quarter. It was not only a dumb decision, greeted by the Eden Park faithful with derision, but Kurtley Beale missed the shot, to magnify the mistake. And with the last play of the game the Waratahs needed a length of the field try to pick up a bonus point for four tries and to finish within seven points, for another bonus point. Those two bonus points can be vital down the track. So what did replacement half Brendan McKibbin do? Grubber kicked, instead of running the ball, which ended up in touch. Full time, chance blown. Another dumb entry into the Waratahs’ burgeoning book of learning the basics. It’s those basics, along with missing pride and passion, that the Waratahs must take to Suncorp next Saturday night. It will be a game they have to win, at all costs, to stay in contention. Which means the Waratahs had better leave their dumb rugby element in the Eden Park shed, or cop a mother-and-father of a cricket score hiding from the Reds.